So in the long list of places I will be visiting when I travel the world, I want to visit St. Vitus Cathedral in Prague. 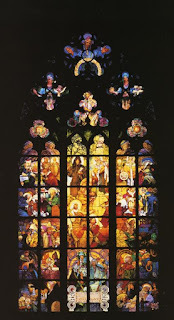 I am a big fan of Alphonse Mucha and visiting this stained glass masterpiece would be amazing to me. I became infatuated with the work of Alphonse Mucha in college. His use of watercolor and bold lines influences my work. The titles of his pieces are inspirational also. Some of my favorite pieces (which I plan to get tattooed on me) "Job", "Moon", "Emerald" and "Winter", just to name a few, are simple concepts that developed beautiful work. If you are not familiar with his work, I highly recommend the Mucha Museum www.mucha.cz (which is a stop I want to make as well) and Olga's Mucha Gallery . I will be making a map of places I need to visit, if you have any ideas let me know!